A custom wine cellar is a climate controlled storage room wherein wines are stored and aged for a prolonged period of time. In a passive wine cellar, the natural underground temperature is used to minimize temperature swings. In contrast, active custom wine cellars involve proper insulation, air tight seals and climate control systems to achieve and maintain the ideal environment for aging and storing wines. Most modern wine rooms are actively cooled, which means that they need to be properly designed and constructed to maintain the desired temperature and humidity. For the long term storage and aging of wines, the required temperature range is between 55°F and 65°F, and the humidity level should be within 40% to 65%. Without stable climate conditions, wines will not mature to their full potential. Custom wine cellar design and wine cellar installation involve the building and installation of all aspects of a wine storage space, including the application of proper insulation, a vapor barrier and drywall, supplying the right type of climate control systems, and providing wine racking solutions, flooring material and wine cellar entry doors. Proper wine cellar construction and wine room preparation is crucial to controlling factors that can influence the environmental conditions of a wine cellar space. Applying sufficient R-value insulation on all the walls and ceiling will keep a wine storage space even. Wine rooms that are poorly insulated (or lack insulation) will experience significant temperature swings that can lead to premature wine aging or spoilage. Due to the perpetually cool environment of a wine cellar the entire interior must be wrapped in a vapor barrier. The plastic sheeting must be installed correctly the first time to prevent costly rebuilds down the line. 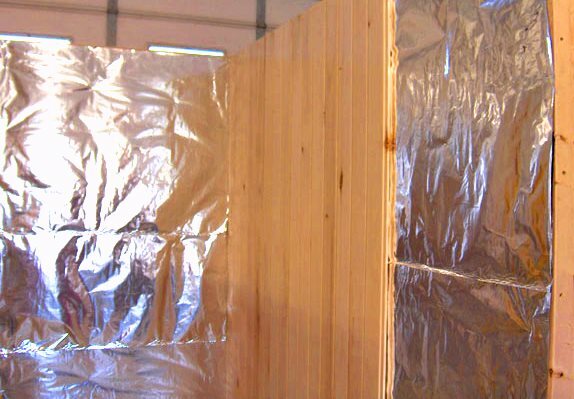 This means that moisture retarders are placed on the warm side of the wall surface to prevent condensation build up. Incorrectly placed vapor barriers can cause damage to the walls, as well as ruin the overall quality of wines. Proper wine cellar design Los Angeles and wine cellar construction should also take into account the type of wine cellar door to be installed. An entryway door to a wine cellar not only completes the overall appearance of the wine storage space, but also provides a tight seal to the room. An efficient wine cellar door must be weather stripped on all sides, and equipped with an automatic door bottom for better seal. It must be exterior rated, to prevent it from warping and shrinking over time. A wine cellar door should be functional and aesthetically pleasing. The right door will completely seal the entryway and prevent outside air from getting into the wine room. It will also enhance the beauty of the wine storage space. 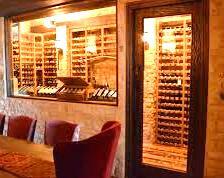 Common materials used in wine cellar doors are wood, glass, wrought iron – or a combination of all of the components. If you choose glass doors, they should be made from dual-pane tempered glass. This provides excellent insulation. Dual pane tempered glass also keeps condensation from forming around the door. Wine cellar design Los Angeles also offers custom etchings on the glass to give a wine cellar a one of a kind appearance. Wooden entryway doors are ideally constructed out of Laminated Veneer Lumber (or LVL). LVL is a wood product that consists of several layers of thin wood, attached together by adhesives. This not only provides better insulation quality and excellent durability, but also makes the door more resistant to warping. Regular doors will often warp over time and loose their ability to keep the room completely sealed. Loss of a good door seal can result in problems with mold, higher running costs and the premature breakdown of the cooling equipment due to excessive run-time. Hand carved detailing on wood wine room doors, along with custom wrought iron designs in glass inset doors can also be a great feature to add. They help create a unique look in any wine cellar. In wine cellar construction and wine cellar design, the right type of wine storage and display racks should be taken into account. Good quality wine racks are essential as they promote proper placement of wine bottles during storage and help to increase airflow. Wine bottles need to be stored on their sides to keep the cork in constant contact with the wine. This maintains the seal and prevents the wine from deteriorating. Custom wine racks are excellent tools for displaying, organizing, and managing small or large quantities of wine bottles. There are any number of styles, sizes and configurations available to fit the design preferences of wine collectors. Wine racks are constructed from different materials, such as wood and metal. 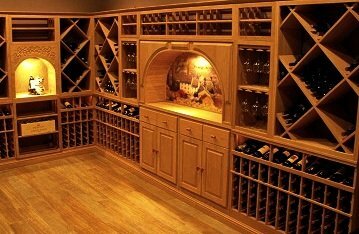 Wine cellar design Los Angeles offers wooden wine racks that are handcrafted using the best wood species, including Mahogany, All Heart Redwood and Premium Redwood. These wood varieties are known for their natural beauty, excellent strength and long term stability. In addition, they are able to take stains and finishes very well. This adds to the aesthetic appearance of the racking – and the entire cellar. 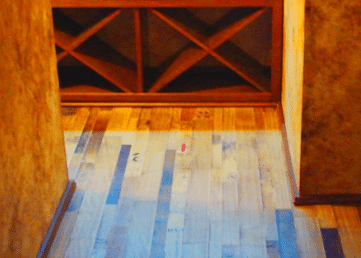 The application of custom wine cellar flooring can enhance the overall décor of a wine storage room. Various flooring materials are used in custom wine cellars, including marble, tile, slate, concrete or vinyl. Ideally floors should be sealed and insulated whenever possible. If concrete is present, a good concrete sealer should be used. Keep in mind that you should never use carpet in a wine room. The cool and damp conditions can encourage the growth of molds and mildew. The use of reclaimed wine barrels can create an exceptional and distinct look in a wine cellar. This wood product comes from retired oak barrels, which are recycled into new construction materials. Custom wine cellar design and wine cellar installation involves installing the proper lighting system for a wine storage space. Wine cellar lighting provides just the right amount of light to illuminate and accentuate different areas of the wine room. LED-based lighting is ideal for a wine storage environment because it produces little heat. Timer and dimmer switches are recommended to minimize exposure of wine bottles to light. Leaving the light on for long periods of time can lead to excess heat. There are a range of wine cellar lighting fixtures available. Wall sconces add dramatic effect, and rope lighting will highlight individual bottles displayed on high reveal wine racks. 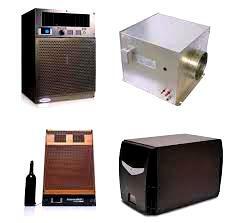 It is of utmost importance that you choose a reliable and efficient wine cellar cooling system. You do not want to take chances with temperature and humidity levels. 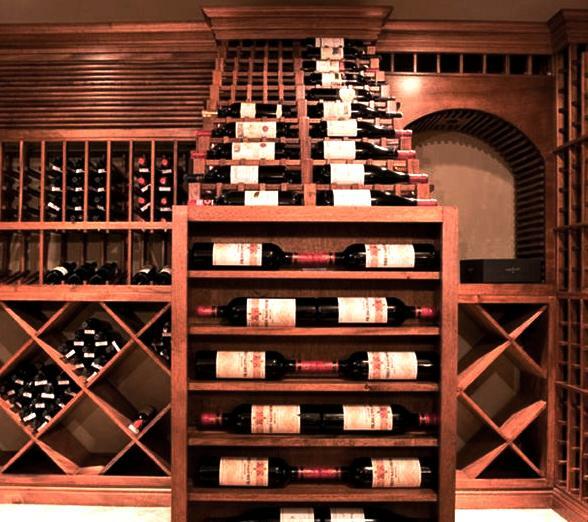 In Los Angeles wine cellar construction and wine cellar installation, master wine cellar builders determine the type of climate control system that is ideal for a particular wine storage space. There are three primary types of refrigeration systems: self-contained through the wall units, split systems and ducted split systems. We believe split systems are the best because they can easily be serviced in place. 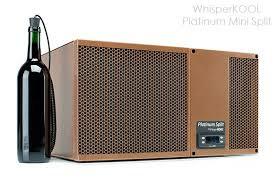 This keeps the servicing time and cost down – as well as the cost of any specific repairs should they be necessary. This is something that owners are usually very pleased about. Simply because of the way they are built, self contained cooling units are not service or repair friendly. Down time, long repair times and high servicing costs never make clients happy! Self contained cooling units cannot be repaired in place and usually have to be completely removed from wall. Often they also have to be taken to the shop or sent back to the manufacturer for repair. That process can take weeks. A custom wine cellar is designed and built like a huge, walk-in refrigerator. As such, there are many details to take into consideration! Simply installing a wine cellar refrigeration system without giving attention to the individual components we’ve discussed will most likely end with premature repairs. Don’t take a chance! Use M&M Cellar Systems to consult on your wine cellar plans before you build! They will then make sure you have a system in place which will function correctly from the beginning – and last for the life-time of your wines.